I just joined a new group called Creative Bloggers. The purpose of this group is to support and network with other bloggers. This weeks featured blogger is Michelle Harvey from Michabella Creations. Michelle creates contemporary jewelry that is very fashion forward. Her work was recently chosen by Keith Lissner for his runway show during Boston's Fashion Week. 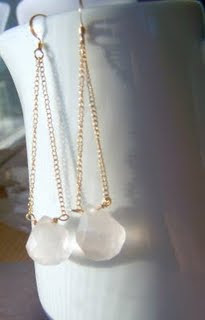 Here is one of my favorite earrings of Michelle's that Keith choose for his show. You can also check out Michelle's web site HERE for some great affordable jewelry. I'm stopping by to thank you for taking part in the comment challenge this month. Take care.